This week we revisit Kazar with this amazing, late 80’s piece. 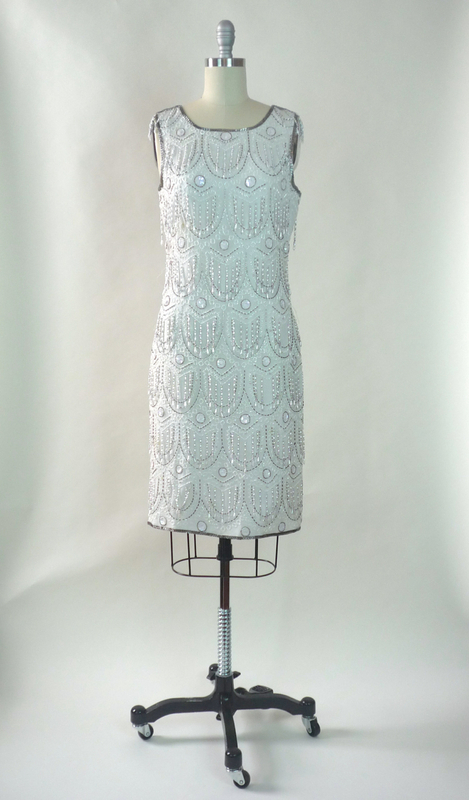 Of course who does not love this figure flattering Sheath in white silk, embellished with white seed beads and silver bugle beads, beautifully arranged in this Deco pattern. 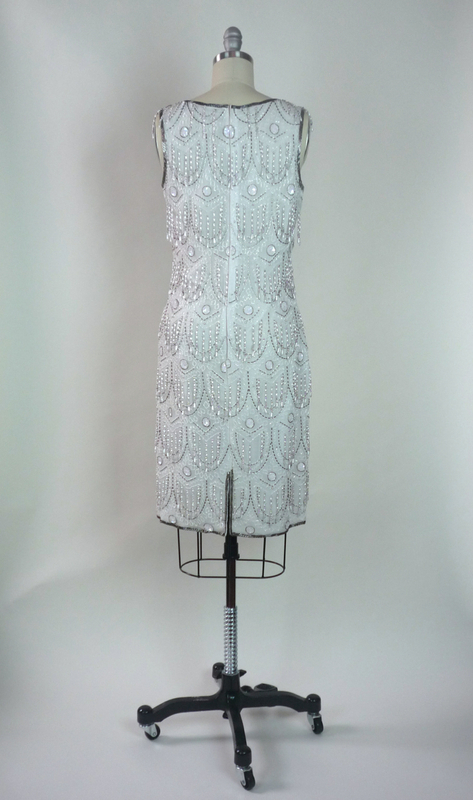 This dress has a Crew, or Jewel neckline, detailed in silver beading mirrored on the Cocktail length hem. 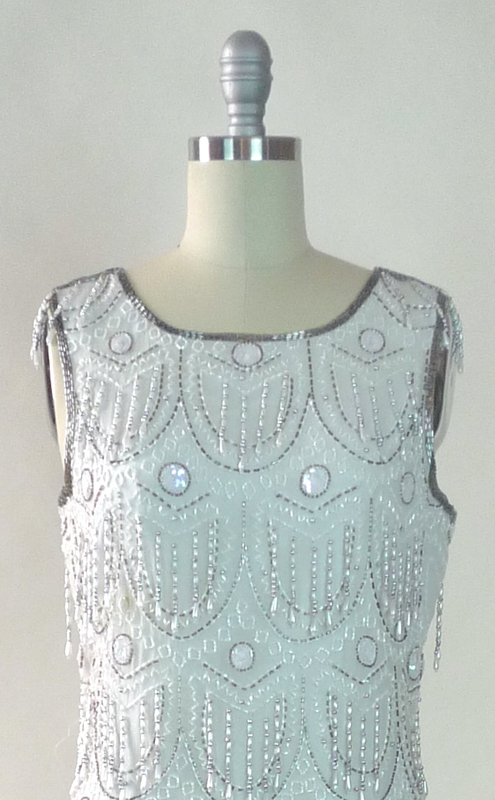 Really adore is the all over pearl beaded fringe, that will sway and speak to the crowds as you dance! Strappy heels with this one, metallic, like silver, or try a sandal in the same. Woah! I’m really enjoying the template/theme ofthis website. It’s simple, yet effective. A lot off timesit’s hard to get that “perfect balance” bbetween usability andvisual appeal. I must say you have done a very good job wiuth this.In addition, the blog loads extreely quick for me on Opera.Exceptional Blog! Thank you for visiting, and we are glad you like the site! Please feel free to reach out again, if you have questions, or other feedback. Thank you for your interest! Great to hear you like the feel of the site. We, too, continually seek the balance between content, and space, information, and a break from information. One great analogy would be through a food experience: a smaller, well seasoned, “amuse bouche, or exciting bite,” essentially, for the reader, who will feel just the right amount of satisfaction, without the “overload” of the full meal of the same deliciousness… a slice of cake, verses forcing down a whole cake! In this way, you can inspire more interest and discussion, because there is “space” left to explore. We hope you get the idea. If you have any further feedback or questions, please feel free to reach out again.